On a daily basis, I read kottke.org and last week saw Jason's note on How to unboil an egg, which links to this article in which Hervé This explains that you can unboil an egg. The science makes sense. The proteins in an egg bind up with each other as heat is applied, this is called denaturation. To break these bonds, you should be able to reverse the denaturation of the proteins, restoring them to a simpler state. The article recommends sodium borohydride, but says that Vitamin C (also know as ascorbic acid) will work. 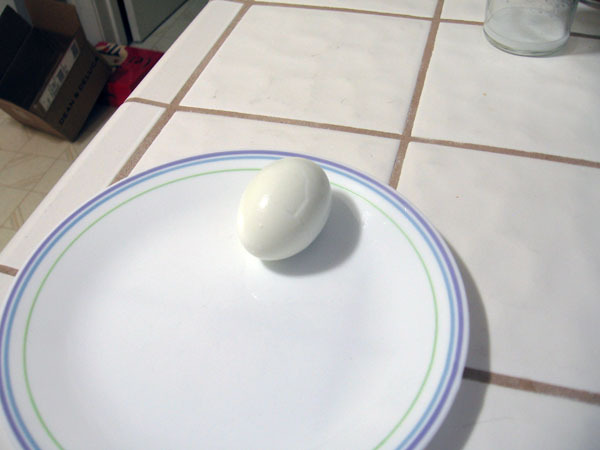 I decided to give unboiling an egg a try. 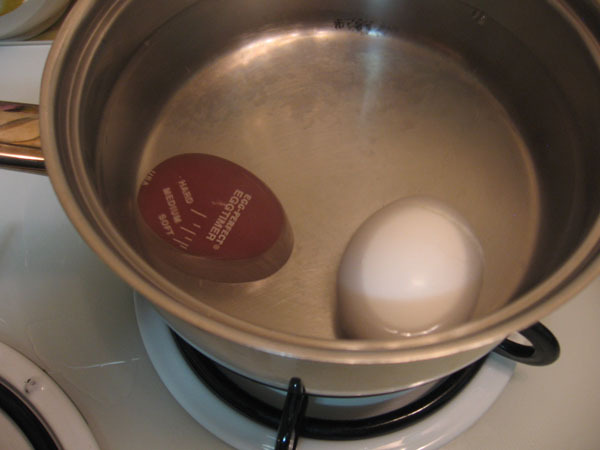 First, I boiled an egg using the highly calibrated egg timer my wife supplied me with. 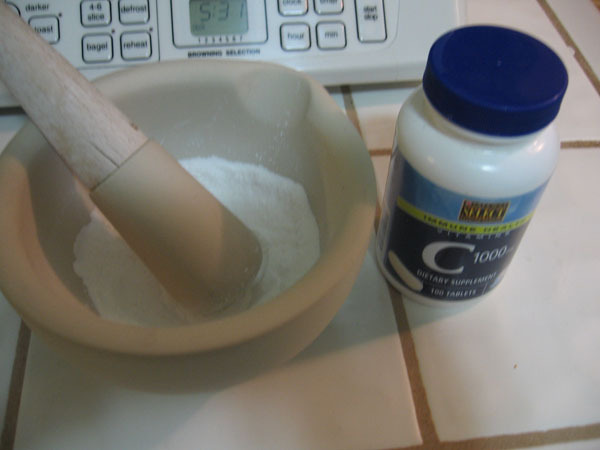 Next I ground up 10 tablets of Vitamin C with my mortar and pestle. 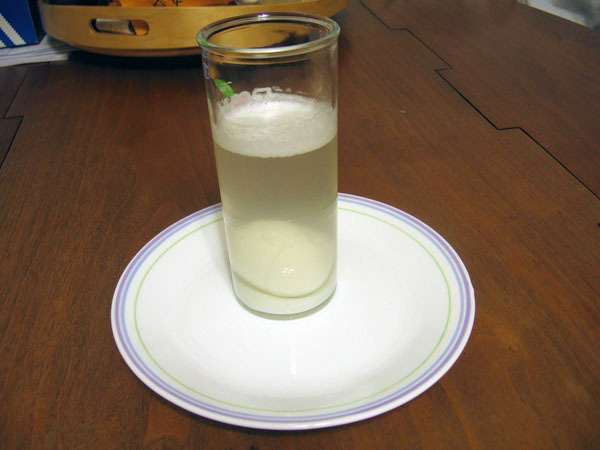 Each being a 1,000 milligrams, adding up to 10 grams of Vitamin C.
Vitamin C (ascorbic acid) is soluble in water, so I mixed the powder into 1 cup of hot water. 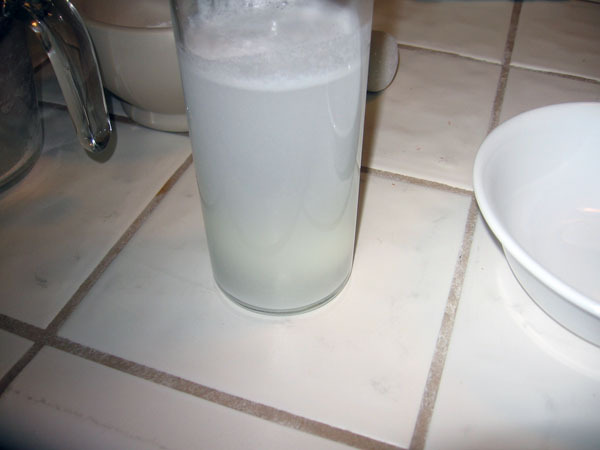 I stirred the solution for several minutes until all that I could dissolve was dissolved. I set the glass on a plate in the dining room and prepared to wait. I was expecting great things. I even set up a timelapse camera to record the experiment. I let the experiment set for 11 hours (7PM to 6AM). The egg was whole and appeared completely unaffected. The texture of the egg outside felt normal and in no way 'unboiled'. While I am a professional engineer, I am a amateur scientist. There are several reasons this process might not have unboiled the egg. In any case, I gave it a try. What are your thoughts? I suspect you need to take the egg out of the shell. It was hard to tell from the video, but from the sound it made, I'm guessing it wasn't peeled. If that's not the problem, maybe the reaction doesn't work at room temperature. did you eat the egg afterwards? 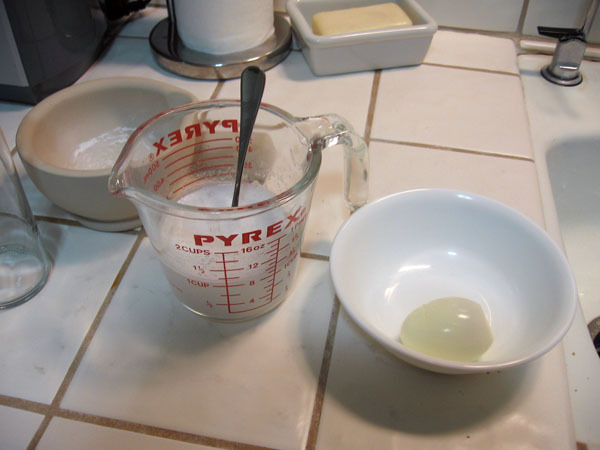 The relative reactivity will be directly dependent on the surface area of the egg. Rather than plopping a whole cooked egg into a glass of vitamin C, I think you'd be well served to chop the egg into bits before placing it in the glass. You could set up a control experiment by doing the same thing to a second egg and placing it in water rather than a vitamin C solution. Also, according to another post regarding Herve This (http://www.the-scientist.com/news/home/53169/), he explains that the borohydride effectively separates the disulfide bonds formed by heating. Sodium borohydride is a very strong reducing agent, and so can accomplish this task. Vitamin C shouldn't have anything like that kind of reactivity, so I'm not convinced it will work here. Powdered zinc is often used as a catalyst for disulfide to thiol reduction. You could try taking some zinc filings and some vinegar, or potentially just adding the zinc to the vitamin C as well. you could also try citric acid or oxalic acid- they should do the same chemistry.